I think I'm ready to make the jump to a two rope system. Half ropes seem to have the most benefits, but how concerned do I need to be about getting a couple of pieces of gear on each rope to be somewhat well protected? The best thing to do is to simply swap the clips as you place each piece of gear. In other words, clip the green rope on the first piece, the red rope on the second piece, the green rope on the third, etc. 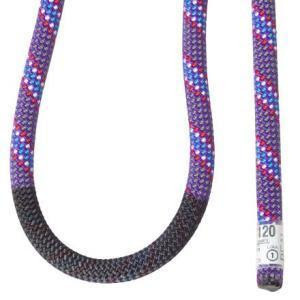 A few ropes on the market are rated as both half and twin ropes (e.g. PMI Verglas). If you use twin ropes for alpine rock, can just one of the twin ropes be safely used for glacier travel on the approach? The problem with using a single twin on a glacier is that twins are very stretchy. If you fall into a crevasse, you are likely to go quite a ways down before you stop. This could be a problem if you hit the bottom or get "corked." I think half-ropes are fine for glacier travel, but not twins.